Bessie Smith, the Empress of the Blues. From Jazzmen, 1939. On this day, we celebrate the 122nd anniversary of the birthday of the Empress of the Blues herself, Bessie Smith. Bessie Smith was born on April 15, 1894 in Chattanooga, Tennessee, though the 1900 census reported that she was born in 1892. Both her parents died while she was still a child, and she and Bessie and some of her siblings turned to busking to make ends meet. Her brother left to join Moses Stoke’s troupe in 1910, and returned later to take Bessie with him. She worked, variously, in stage shows and on the T.O.B.A. vaudeville circuit. 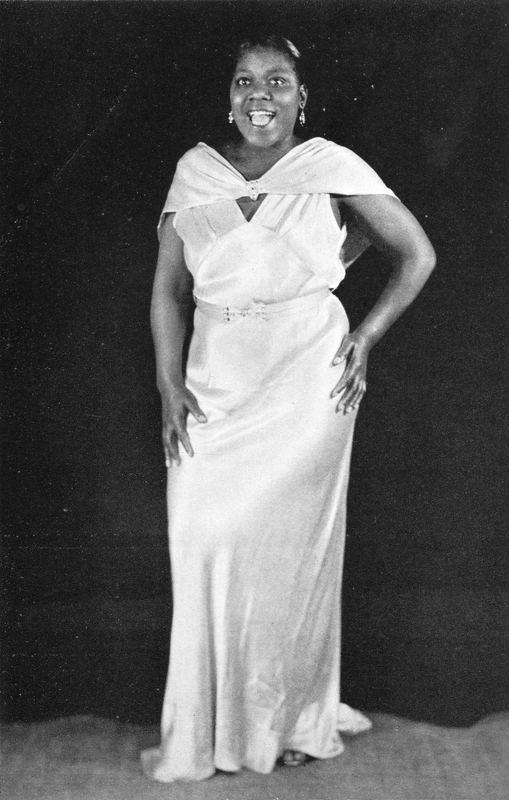 In 1923, Smith was in New York, and made her first records for Columbia, with whom she would remain for the rest of her career, save for a few Columbia’s subsidiary Okeh. She became a fixture of the Harlem Renaissance, and the highest paid black performer in the United States. In 1929, she made her only filmed appearance in St. Louis Blues. Hard times came with the Great Depression however, she made her final recordings on Columbia in 1931, and after a hiatus, made four more in 1933 for Okeh, accompanied by Buck Washington and his band, which proved to be her last. 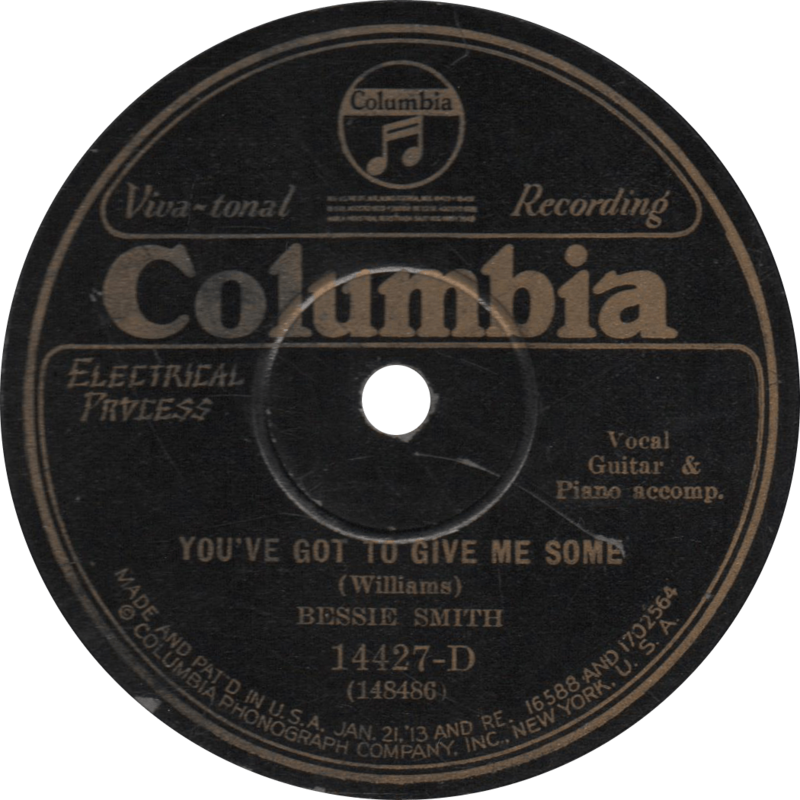 Columbia 14427-D was recorded May 8, 1929 in New York City by Bessie Smith. She is accompanied on piano by Clarence Williams and on guitar by Eddie Lang. The DAHR shows takes “2” and “3” were issued on both sides, these are “3” and “2”, respectively. Both sides are more than a bit on the raunchy side, so if you’re a prude, you may want to turn back here. On the first side of this disc, Bessie sings “I’m Wild About That Thing”, probably one of her more famous tunes. 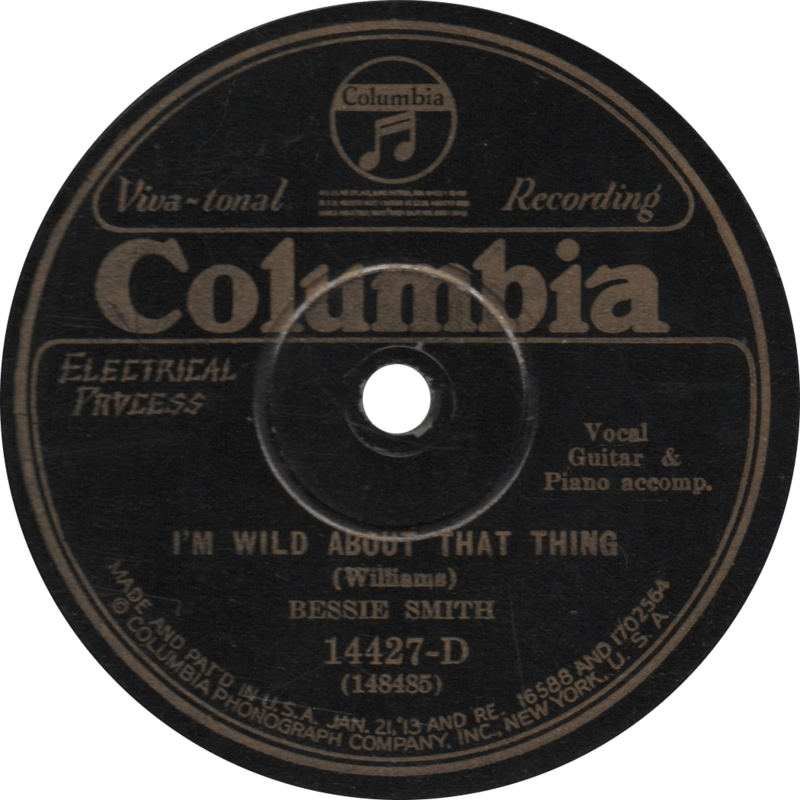 I’m Wild About That Thing, recorded May 8, 1929 by Bessie Smith. On the reverse, Smith sings the equally racy “You’ve Got to Give Me Some”. You’ve Got to Give Me Some, recorded May 8, 1929 by Bessie Smith. This entry was posted in Records and tagged 1920s, 1929, Bessie Smith, Blues, Clarence Williams, Columbia, Eddie Lang, Harlem, Hokum, Jazz, New York, Race Record, Vaudeville by R. Connor Montgomery. Bookmark the permalink.